If you're already agonizing over your grocery shopping list, this study might not help. New research from Stanford University and Johns Hopkins University suggests a direct link between eating canned foods and levels of the chemical BPA found in the body. BPA or Bisphenol A is an industrial chemical used to make certain plastics and resins, like the lining that prevents bacteria from entering through dented cans. Small amounts of BPA in food packaging can transfer to food and drinks, which has raised concerns among health and environmental groups since the chemical is a known hormone disruptor. In 2012, the U.S. Food and Drug Administration banned BPA from baby bottles and children's drinking cups. The following year, it banned BPA from infant formula packaging, though the administration's current position is that BPA is "safe" for the "for the currently approved uses in food containers and packaging." Since diet is the main source of BPA, Stanford medical research fellow Jennifer Hartle wanted to see just how much BPA in food packaging could end up in our bodies. The study she led included more than 6,000 children and adults. The individuals are part of the Centers for Disease Control and Prevention's ongoing health survey, which is intended to be representative of the entire U.S. population. The study found that subjects who ate canned food within the past 24 hours had higher levels of urinary BPA than those who did not. And the more canned food people ate, the more BPA showed up in their urine. 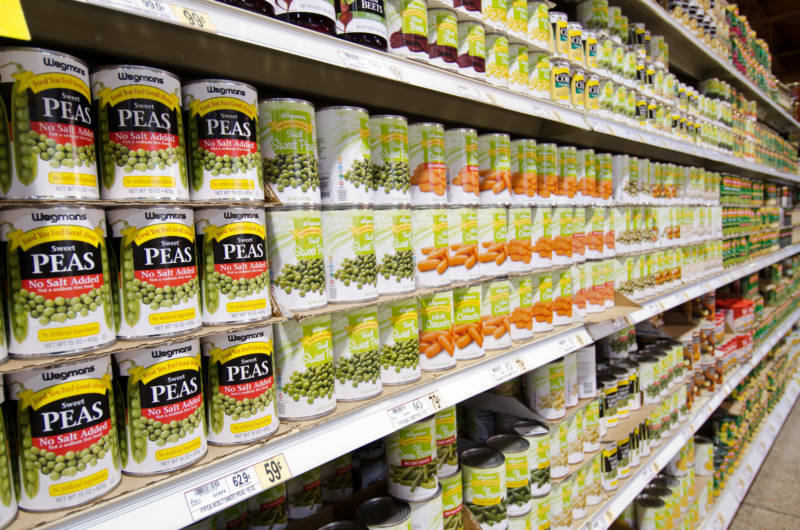 People who ate the most canned food (two or more items per day) had up to 54 percent more BPA in their urine than those who ate less or no canned food at all. It also found that not all foods are created equal. Eating canned soup led to higher BPA levels than eating fruits, possibly because cans for fruit have the lowest BPA concentrations. "Of all the different kinds of BPA exposure that people can have, I didn't know that I'd find the clear relationship between canned food and urinary BPA." Rene Vinas, a toxicologist with the Grocery Manufacturers Association, a food industry trade group, says eliminating BPA from all packaging will time. "There is a lot of work being done for BPA in metal cans," says Vinas. "There are some alternatives which our members are using, like acrylic, but the transition away from BPA isn't complete. It requires numerous levels of testing." Some companies including Amy's Kitchen, Muir Glen and Eden Organic use BPA-free linings, but the alternatives are not necessarily healthier. Substitutes include acrylic, polyester and polyvinyl chloride which is a known carcinogen. Hartle's study didn't examine whether the amount of BPA consumed exceeded the FDA's daily recommended dose. But she pointed out that, "even very low doses can have a health effect." In animals tests, the chemical has affected fetal development and led to an increased risk for cancer. Most Americans have some levels of BPA, from their diets and the environment, though they may not know it. A 2008 Centers for Disease Control and Prevention study found 92 percent of Americans contain traces of BPA in their urine. Hartle concedes that counseling consumers to avoid canned food all together could be a tough sell. "A lot of people live on canned food because it is very affordable and it is non-perishable so it's a bigger picture problem than to just tell people not to eat canned food." She said more research needs to be conducted on the long-term effects of BPA, which are not yet fully understood.